The new SMS Centre menu provides links to all SMS related actions. By default, all SMSs received will be displayed in descending chronological sequence on the Incoming SMS page. You can use the Channel dropdown selector to filter SMSs based on the channel associated with each sim card registered with the Freedom Fone server over time. Even if a device is later removed, the channel originally associated with it will remain as an option within the Channel filter list. 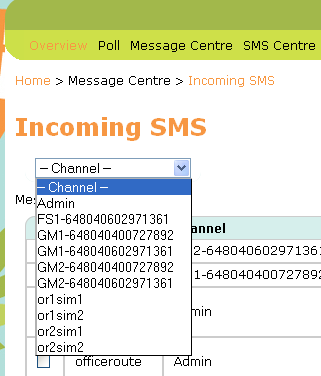 To redisplay all SMSs, select '- Channel -' from the Channel selector. We provide configuration files for the OfficeRoute to help you set the device up for use with Freedom Fone. Make sure your OfficeRoute firmware is updated to v2.3.22 using the OfficeRoute Administration → Update page before trying to load our configuration files. You can view the current firmware version on the OfficeRoute Network page under System Information. Upload backup_officeroute_2.3.22_140614.tgz using the OfficeRoute Administration → Configuration Backup → Upload config page if you want to aggregate SMSs into one Admin Inbox for all sim cards in the OfficeRoute. Upload backup_officeroute_2.3.22_multiSMS_outSMS_140614.tgz using the OfficeRoute Administration → Configuration Backup → Upload config page if you want to separate SMSs into different Inboxes for each sim card. For more information on setting up the OfficeRoute for SMS receiving, please see the latest version of the Sharicus_2S7_developer_guide. USB dongles can be set up in 3 different ways using the Hardware Wizards. For more information on the Hardware Wizards and setting up Huawei dongles for SMS receiving, please see the latest version of the Sharicus_2S7_developer_guide. 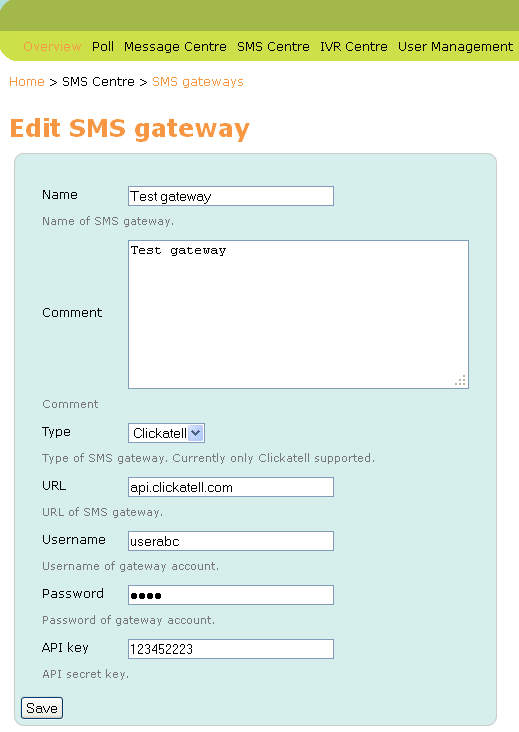 Create an SMS Gateway for your Clickatell Developers' Central account in Freedom Fone using SMS Centre → SMS gateways. Click the Create new button in the top right hand corner of the page. You will be presented with a form to complete for the SMS gateway. Enter the details provided for your Clickatell account. Read more about Interfacing with Clickatell in the Sharicus_2S7_developer_guide. See the latest version of the Sharicus_2S7_developer_guide for instructions on how to set up the OfficeRoute for sending SMSs. The Sharicus_2S7_developer_guide will also show you how to update the necessary Freedom Fone and Postfix configuration files. Please also check your OfficeRoute Normalisation settings against the information provided in the latest version of the Sharicus_2S7_developer_guide. Firewall: If your OfficeRoute is connected to the Internet it is recommended that you use the new Firewall Wizard to protect yourself from VoIP spammers. For more information on setting up your firewall and whitelist see the Sharicus_2S7_developer_guide. We have only tested the Huawei E173 and E1550 dongles with Freedom Fone. See the latest version of the Sharicus_2S7_developer_guide for instructions on how to use the Hardware Wizards to set up your Huawei dongle for sending SMS. Note that a dongle cannot be used for voice and SMS sending. It must be designated for one or the other. Dongles are able to receive SMS regardless of whether or not they have been set for voice or SMS sending. To send SMSs to one or more recipients, create a plain text document with one phone number per line. Do not end each line with any form of punctuation. 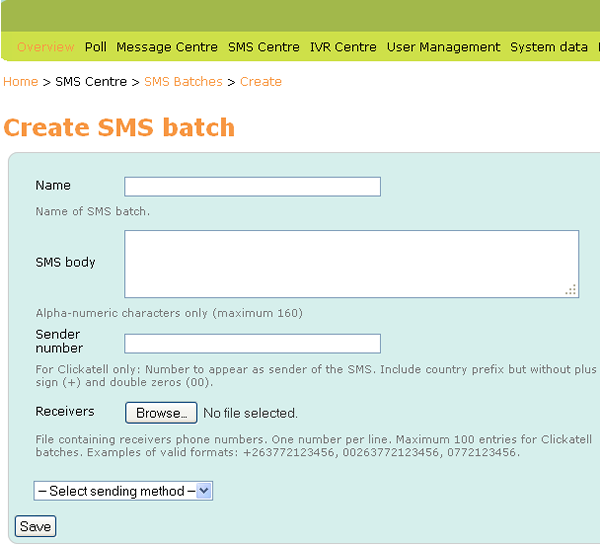 Go to SMS Centre → Create batch to send your message. Name: Provide a descriptive name for the outbound SMS for administrative purposes. Sender number: This field is only used for Clickatell accounts. Enter the phone number you have registered with Clickatell for sending SMSs. Do not add any country prefix to the number. 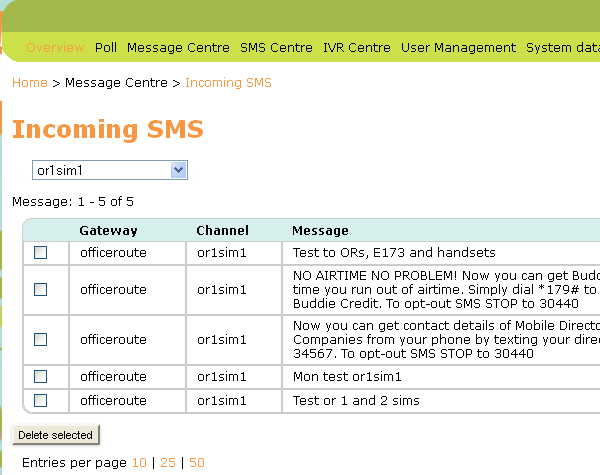 Receivers: Browse for the text document that contains the phone numbers for your SMS recipients. Once you click the Save button, Freedom Fone will attempt to send your message to your recipient list. 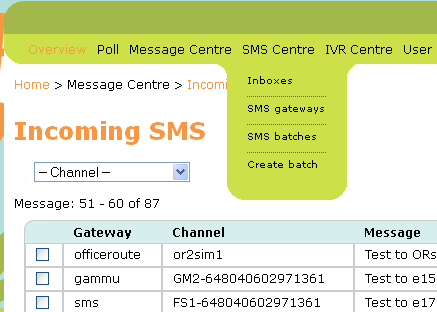 Go to SMS Centre → SMS Batches to view details of SMSs sent. Click the hand icon to view details of SMS batch recipients and the delivery status associated with the message sent to each recipient. 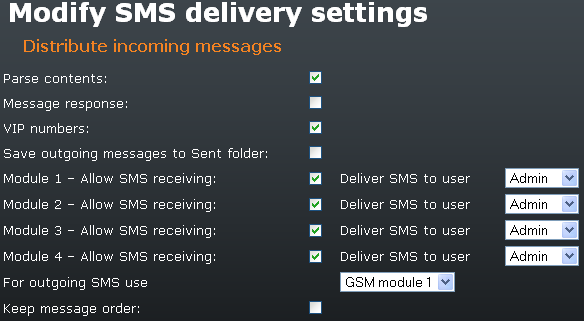 Note that delivery status messages are currently only available for SMSs sent via Clickatell and dongles.